The spirit of Dartmouth College requires tending or it will wither. Now it is 2017, and another massive sequoia tree with a tunnel bored through its trunk, the Pioneer Cabin Tree, has fallen, bashed to the ground by buffeting storm winds on Jan. 9. Calaveras Big Trees State Park is filled with trees estimated to be around 1,000 years old; it is likely that the recently fallen tree was about that age. The more recent loss was relatively young, but even the Wawona Tree wasn’t so old — sequoia trees can easily live three millennia. In both cases, there must be serious consideration of human guilt and responsibility for the toppling of these giants of the forest. Sequoiadendron giganteum are the largest living organisms by volume and do not die easily. Having huge tunnels bored through their trunks doesn’t kill them, but it can’t be said to help when storms come whipping through the Sierras. John Muir defended and spoke for living things that could not do so for themselves. While the spirit of Dartmouth College is not alive, it exists and that is worth defending. It requires defense because Muir’s words are just as applicable to various emails sent intermittently to the student body by various administrative bodies. An email the Winter Carnival Council sent out to campus on Jan. 13 is the most recent example. In this email, various factors such as warmer weather and a lack of student involvement and leadership were cited as reasons for the abandonment of a sculpture for Winter Carnival. These reasons are indubitably true. It is also the case that it is beginning to become normal for the Green to be bereft of a sculpted mass of ice and snow. It is also the case that a rogue group of students sculpted a dragon on their own initiative. The spirit of Winter Carnival was certainly alive and well this year, but for how long? The Winter Carnival Council is less at fault so much as they are part of a trend. Dartmouth is more than classes, the professors who teach and the students who attend. It is the Lone Pine, the hike to summit Mt. Moosilauke before sunrise on First-Year Trips, walks across the Green under a snowy night — a collection of experiences that causes alumni to excitedly proffer their hand and talk your ear off in an airport about a place you inhabit and they remember, all because you were wearing a green shirt that said “DARTMOUTH.” It is difficult to see precisely what moves through groups of Dartmouth students or alumni when they sing the alma mater. It would be hard to define, yet there was no question it would be the alma mater that brothers and students would sing, swaying together in the twilight, during the vigil for Adam Wright ’17. The spirit of the College on the Hill is a combination of those who study, teach and administrate. Currently, it seems that members in the latter group are more worried about their jobs and the institution’s bottom line than what is important. Assuredly, there are many doing good work and there are many facets to running a college successively. However, the absence of a snow sculpture is not the only warning sign. A recent decision to end need-blind admissions for international students makes sense financially; it does not make sense in the spirit of a college founded to educate Native Americans. 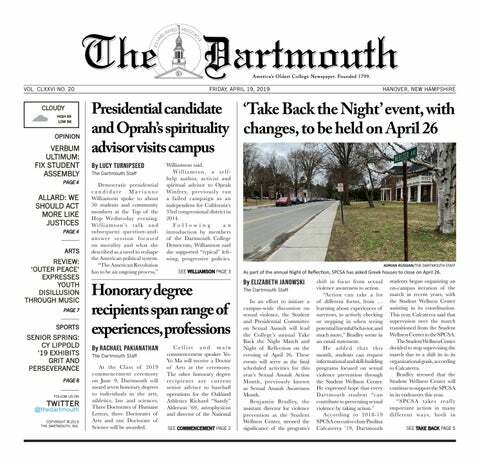 Moving Dartmouth Forward is notable, not for where it fails or succeeds, but for the fact that College President Phil Hanlon’s major piece of policy was asked for by no one. If you attend any of the carefully tailored — and exceedingly rare — interactions Hanlon has with the student body, you will realize that there is no real engagement. The points you could read, or derive for yourself from the Hanlon administration’s policies, are only reiterated to the audience. Ask about why Hanlon thought Dartmouth needed housing communities and you will hear about their benefits. Your question will, however, remain unanswered. I do not think Hanlon is boring a hole in the Lone Pine, widening it bit by bit until the inevitable happens. But I do think that the current administration is neglecting what is important to keeping Dartmouth a place alumni think more than fondly of. Loyalty to alma mater is relatively ordinary; the loyalty and love Dartmouth alumni have for the College is extraordinary. My concern is that Phil Hanlon is looking forward by forgetting the past. My fear is that Hanlon is planting trees, but he’s planting the wrong ones. There is nothing wrong with an Institute for Energy and Society; there is everything wrong with it being situated at Dartmouth. This College is supposed to make the world a better place by producing quality graduates. Dartmouth takes on the world’s challenges by molding the men and women who will face them. It is a college, not a university, and for that explicit reason I — and likely many others — chose Dartmouth over other august universities because it seemed like a school more interested in teaching its students than trumpeting its merits. The problem is that Hanlon doesn’t seem to want to do anything else but “Move Dartmouth Forward,” and people are not blind to his behavior. Only 31.3 percent of the class of 2016 participated in the Senior Gift. This is down from over 60 percent from the class of 2015, and is an unprecedented low compared to the rough average of 80 percent for past years. All this is to say that Muir’s cautioning words — “few destroyers of trees ever plant any; nor can planting avail much toward restoring our grand aboriginal giants” — are spot on and eerily so if the Lone Pine symbolizes that feeling I described earlier, present in the sons and daughters of Dartmouth when they sing the alma mater together. This administration is planting the wrong trees. They are destroying the grand original spirit that has infused Dartmouth since 1769. They may not be doing so willfully, just as those who bored tunnels through sequoia trees could not know, nor can we, whether or not their actions sliced centuries off of the “grand giant’s” life spans. Age is not protection from the present, it is survival to the present. The spirit of Dartmouth, her traditions, they need caretakers who care deeply. All the actions of the current administration suggest that its members do not care deeply. If they did, there would be dialogue, there would be communication with students and faculty. Instead we get missives from time to time in the form of emails, telling us that now this will be, or now that is forbidden. The administration would do well to take note of the real engagement between students and faculty, and the Lone Pine they are currently responsible for tending. The original version of this column stated that Dartmouth ended need-blind admissions. The article should have stated that the College ended need-blind admissions for international students. This column has been updated to reflect this correction.